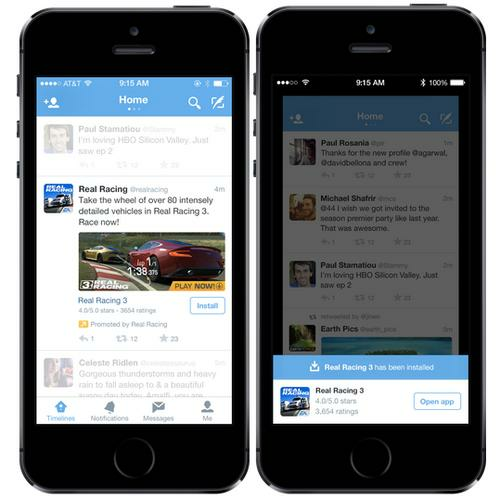 Twitter is ramping up its mobile advertising capabilities with a new mobile apps install that will bring more ads into user feeds, as well as an acquisition in the programmatic mobile advertising space. After a test period, Twitter said on Monday that it was rolling out its "mobile app installs" program globally, which lets companies promote their mobile apps in users' feeds. The new capabilities apply to apps in both the Apple and Google stores. Twitter began testing the program with a limited number of advertisers in the US in April -- tests that the company says went well. Participants in that program included mobile ride-hailing service, Lyft, and games publisher, Electronic Arts. The program lets companies publish links to download mobile apps. These ads are meant to appear like regular posts in users' feeds. Mobile app ads have become very successful for Facebook, helping to drive the download of roughly 60 per cent of the top-grossing apps in Apple's App Store, according to the company. Twitter, for its part, is looking to better monetise its service amid sagging user growth. The company has yet to turn a profit. Twitter already lets advertisers target their ads by users' interests, keywords, favourite TV programs, language and other criteria. Advertisers promoting their mobile apps will be able to leverage those capabilities too, the company said. Alongside news of the mobile app install program, Twitter also announced the acquisition of mobile retargeting vendor, TapCommerce. The deal follows on from its acquisition of mobile ad exchange, MoPub, last September. TapCommerce provides a real-time programmatic buying platform for mobile advertising that it claims covers more than 50,000 apps. In a blog post, Twitter said the latest purchase will provide mobile app marketers with better ways to re-engage mobile app users through real-time programmatic buying tools and measurement capabilities. “Combined with our other ad solutions, advertisers will be able to drive conversions and ROI with mobile consumers on and off of Twitter, across the full user lifecycle – from acquiring new users through app installs, to engaging existing users who already have the advertisers’ apps on their device,” Twitter vice-president of global online sales, Richard Alfonsi, said in the blog post. The latest acquisition comes just weeks after Twitter purchased native advertising vendor, Namo Media, which produces technology that allows app developers to add native advertising to mobile apps.